No matter if you are celebrating Christmas, Hanukkah or Kwanzaa, Washington DC and the surrounding areas in Virginia and Maryland always have festive holiday activities for the whole family. While staying in Fairfax County, there is always something to do during the winter season. Here are some of the annual events and others that you just may not want to miss this December! People are drawn from all over to witness this American tradition. In early December of every year since 1929, our President has the honors of lighting up the National Tree - an American tradition (this year it takes place on November 28). In 1954, a "Pathway of Peace" - 56 smaller, decorated trees representing all of America&apos;s 50 states, five territories, and the District of Columbia - were planted surrounding the National Christmas Tree. This tradition continues today, so if you&apos;re visiting from out of town make sure to stop by and say hello to your state&apos;s tree (we hear the Virginia one is pretty nice). 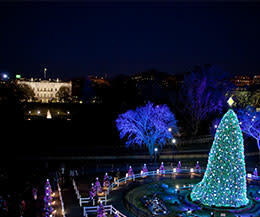 The Pageant of Peace on the White House Ellipse also includes the National Menorah. An official lighting ceremony on December 2 signals the start of Chanukah, followed by the lighting of a candle throughout each night of the holiday. 2. Pose with "The People&apos;s Tree"
The tradition of the Capitol Christmas Tree, or "The People&apos;s Tree," began in 1964 when Speaker of the U.S. House of Representatives John W. McCormack (D-MA) placed a live Christmas tree on the Capitol lawn. 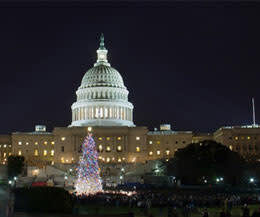 In 1970, the Capitol Architect asked the U.S. Forest Service to provide a Christmas tree. Since then, a different national forest has been chosen each year to provide "The People&apos;s Tree." This national forest also works with state forests to provide companion trees that are smaller Christmas trees for offices in Washington, D.C. 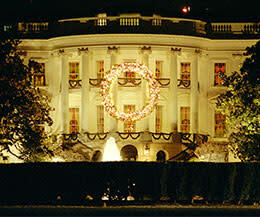 This year the tree will be lit on December 6 by the Speaker of the House, and hails all the way from Oregon! 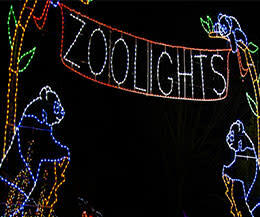 From Nov. 23 to Jan. 1 (except Dec. 24, 25 and 31) join the thousands of visitors who make ZooLights a part of their annual holiday tradition. A free event, ZooLights includes live music performances, tasty winter treats and plenty of opportunities for holiday shopping. More than 500,000 environmentally-friendly LED lights transform the Zoo into a winter wonderland complete with a dazzling light show set to music! Also, the Smithsonian&apos;s National Zoo Choo-Choo takes a merry tour on a trackless train that whisks guests around the Great Cats exhibit and features gorgeous views of the holiday light displays. And for thrill seekers, you&apos;ll find Snow-less Tubing as you take the plunge down one of the 150-foot-long tracks—no snow necessary! 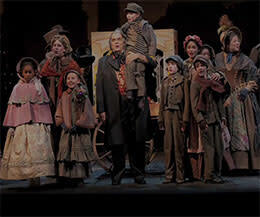 Take in Charles Dickens&apos; classic in the confines of an iconic American theatre. Join the ghosts of Christmas Past, Present and Future as they lead the miserly Ebenezer Scrooge on a journey of transformation and redemption. Over the last several years, Ford&apos;s has been engaged in a dramatic expansion and renovation. In 2009, Ford&apos;s reopened a restored and renovated theatre along with a re-imagined museum, illuminating the world of Civil War Washington and the years of Lincoln&apos;s presidency. In 2012, Ford&apos;s opened the new Center for Education and Leadership, expanding the pathways for connecting with Lincoln&apos;s legacy. This year&apos;s production of A Christmas Carol runs from November 15 - December 30. The 2018-2019 ice-skating season at this prime spot along the National Mall begins November 18 and continues through March 11, 2018, weather permitting. Experience ice-skating in the Sculpture Garden while surrounded by large-scale sculptures by contemporary artists. The Gallery and Sculpture Garden are closed on December 25 and January 1. Please note the ice rink will be closed when it rains or when the temperature dips below 20°F, so call (202) 216-9397 for info when the forecast looks gloomy or extra-cold. 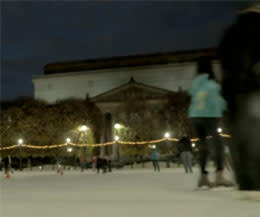 During evening ice-skating hours, when the National Gallery of Art and surrounding Sculpture Garden are closed, access to the rink is restricted to the Constitution Ave. and Madison Dr. entrances at 9th Street. Whether you&apos;re a Washingtonian or visiting from far away, you&apos;ll feel right at home with the Kennedy Center&apos;s seasonal performances full of tradition and holiday cheer! President John F. Kennedy was a lifelong supporter and advocate of the arts, and frequently steered the public discourse toward what he called "our contribution to the human spirit." 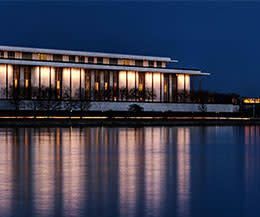 Two months after President Kennedy&apos;s assassination in November 1963, Congress designated the National Cultural Center as a "living memorial" to Kennedy, and authorized $23 million to help build what was now known as the John F. Kennedy Center for the Performing Arts. At the U.S. Botanic Garden from November 22 through January 1 the Conservatory boasts one of the largest indoor decorated trees in Washington, D.C., and a showcase of poinsettias. And it wouldn&apos;t be the winter holiday season without the train display in the East Gallery, where trains chug along tracks around and above you through imaginative structures created with plant materials. Explore Pollination Station where you can visit over-sized flowers, bees and butterflies in this year&apos;s scenic wonderland. Also see D.C. landmarks such as the Capitol, Lincoln Memorial, and the Washington Monument, all made from plants, on display in the Garden Court. Also take note that no matter how cold it gets during winter in D.C., the U.S. Botanic Gardens stays nice and warm year-round - so it&apos;s a great place to go to escape winter&apos;s chill. You don&apos;t have an unobstructed view because of the security fence, but you can still catch a sweet glimpse of the Presidential Mansion in all its glory, beautifully decorated for the holiday season. People gather mostly at the north side of the mansion along Pennsylvania Ave. to get closer, but you can actually get a great view, take great pics, AND position yourself near National Christmas Tree and National Menorah from the Ellipse on the south side. From snowball fights to gingerbread houses to digital trees, the White House is a treasure trove of holiday traditions - old and new alike. 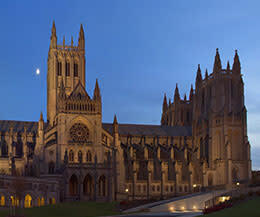 The National Cathedral is one of the most iconic structures in all of DC. During the holiday season you&apos;re invited to attend original and classic compositions that stir the soul and inspire the mind with meditative and moving performances. You&apos;ll see that the National Cathedral provides the perfect setting for some of the season&apos;s most joyous music, performed by a team of international soloists with the Cathedral&apos;s own combined choirs and Baroque orchestra. One of the most popular concerts is Handel&apos;s Messiah which takes place on select days in December. In fact, all kinds of holiday events span the month of December so check their website for a complete listing of performance times. 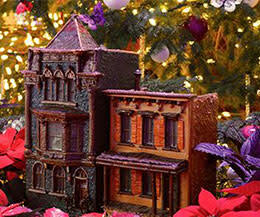 This year the Downtown Holiday Market (DHM) will operate for 30 consecutive days and will have 4 weekend dates. It will open Friday, November 23, and will run continuously through Sunday, December 23. Hours will be from Noon to 8 pm each day. 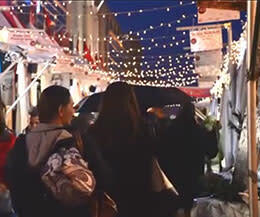 Bringing a unique and festive shopping "village" to the heart of Downtown DC, the market is centered around 8th and F Streets and features more than 150 regional artisans, crafters and boutique businesses of ethnically produced goods. Hundreds of diverse gift items, such as jewelry, pottery, paintings, and textiles will be offered by 60 exhibitors each day. Check back as the exhibitors rotate and the selection of goods will vary daily. You&apos;re sure to find something special for everyone on your list.